This is only a test post. Nothing to see here, move along. The Milo Historical Society program, Milo’s Native History, scheduled for April 27 at the Milo Town Hall at 6 PM, has been postponed until a later date due to circumstances beyond our control. Thank you. The next monthly meeting of the Milo Historical Society will be on Thursday, April 20 at 7 PM at the museum on High Street (next to Bailey Lumber Co.). Anyone with an interest in our community’s history is welcomed and encouraged to attend. 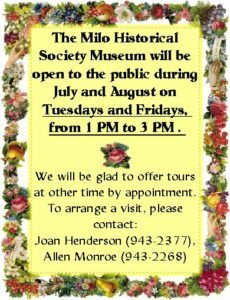 The Milo Historical Society Museum is closed for the season. Appointments may be made to visit through the month of October by calling Allen at 943-2268.